If cows were born to eat grass, why are lactating dairy cows rarely fed grass forages? 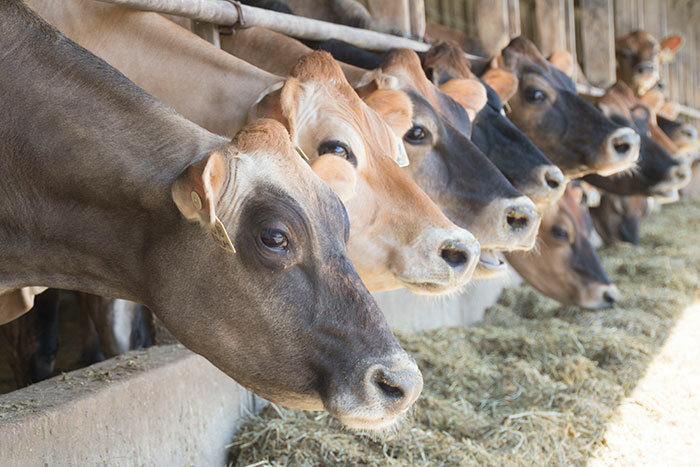 The answer, according to Pat Hoffman, is simply that as modern dairies have advanced in production, they have fueled their herds with more efficient feed, such as alfalfa and corn silage. Hoffman, a dairy technical support specialist for Vita Plus, says in the company’s Forage Foundations newsletter that cereal grasses have come on the scene more recently in the Upper Midwest and along with them comes a different approach to nutrient management. Along with greater demand for forage inventory, nutrient management has allowed cereal grains to find their way back into popularity; cereals are able to use additional nutrients from manure. “Planting winter cereal crops such as winter triticale or winter rye also capture extra forage yield as these crops are well adapted to grow under our cool fall and spring conditions,” says Hoffman, a former University of Wisconsin extension dairy specialist. When it comes to feeding in the Upper Midwest, Hoffman notes that corn silage inventories are fixed, so cereal silages often replace legume silage in the diet. Both must be harvested early in maturity in order to maintain forage quality. Hoffman states that when harvested at the flag leaf or early boot stage, triticale and rye may contain 14 to 18 percent crude protein (CP) and 42 to 48 percent neutral detergent fiber (NDF). On the other hand, cereal forages have some notable differences that need to be accounted for. Hoffman warns that dietary calcium and potassium must be watched as cereal forages are much lower in calcium and can be very high in potassium. “High potassium levels in grass forages and in the cow can interfere with magnesium utilization,” Hoffman cautions, advising a boost in magnesium supplementation when adding grass forages to the diet. Additionally, fiber type is a factor in a grass forage-based diet. Cereal forages have more hemicellulose and less lignin than alfalfa, Hoffman explains. Because of this, cereal forages have less undigestible NDF and greater NDF digestion when compared to alfalfa. Research has also shown that legume forages have a higher passage rate than grass forages, he adds. Nevertheless, Hoffman has observed excellent milk production potential when high-quality grasses replace a portion of legume forage in the diet.